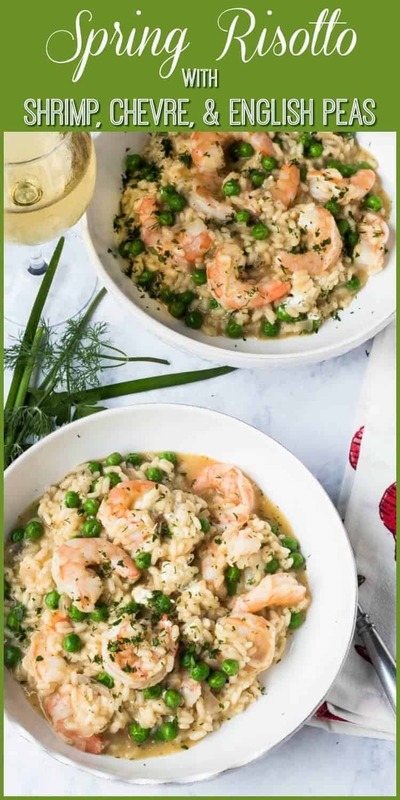 Creamy risotto with delicate, herbaceous dill, plump Gulf shrimp, and spring-fresh English peas, all tossed with creamy chèvre…Spring Risotto with Shrimp, Chèvre and English Peas tastes like spring, and makes a perfect main course for your beautiful Easter brunch or supper! Disclaimer: This post is sponsored by Bob’s Red Mill, but the content and opinions are my own. I have enthusiastically used their products for years! I love spring anywhere, but if I could choose I would always greet it in a garden. Nothing exemplifies spring (in my mind) like fresh plucked dill from my garden. 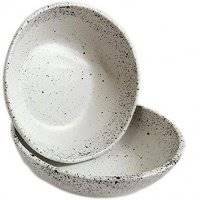 It almost always makes an appearance on my Easter table. When we lived in New Mexico, our favorite Easter entrée was gravlox made with a side of salmon, and cured with an entire bunch of fresh dill! Mmmm… With only 2 of us to feed, gravlox aren’t really practical, but I still love to include fresh dill, even if it’s “just” a simple side of English peas and carrots with butter and fresh dill. What foods do you associate with spring and Easter? Living near the Gulf of Mexico, Gulf shrimp has become a regular part of our diet. These wild-caught shrimp feast on the nutrient-rich waters of the Gulf, making them a far tastier choice than their farm-raised counterparts fed who-knows-what. They are low in fat (lean protein! ), low in calories, zero carbohydrates, high in omega-3 fats (“good fats”), and contain 2 less-common antioxidants – astaxanthin (provides the red color in fish and shellfish) and selenium (aids in thyroid function). Eat. More. Shrimp! So, on to the Spring Risotto with Shrimp, Chèvre, and English Peas! This bowl of goodness starts out with premium-quality arborio rice from Bob’s Red Mill. 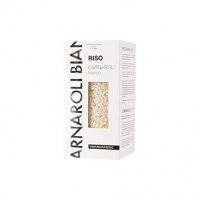 As I mentioned in Seared Scallop with Mushroom Risotto, arborio is the only rice I have found in the United States that is suitable for risotto. This short-grained rice yields risotto that is creamy, chewy, and firm to the bite. The finished dish should be creamy, never gloppy! Bob’s Red Mill products are widely available in the U.S., directly from the company online, and via Amazon. Their products focus on healthy, all natural, grains, flours, cereals, etc. Keep in mind that risotto is not a “set it and forget it” dish. The broth is brought to a simmer in a separate pan, then added by ladles full to the arborio rice. As the broth absorbs, more is added, stirring frequently. 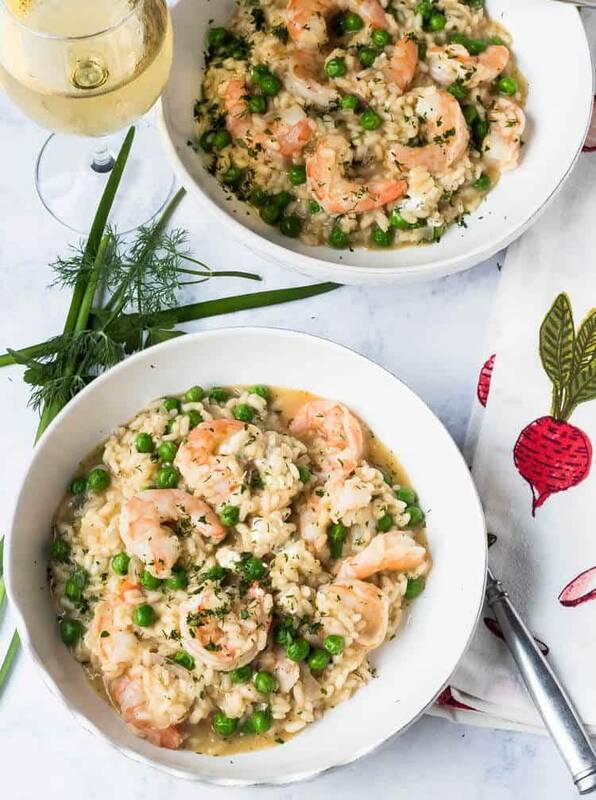 The shrimp and peas only spend the final 5-6 minutes in the cooking rice. Finally, the chèvre and fresh dill are added, and gently stirred. Does this not look and sound like spring? I do hope you’ll give it a try! 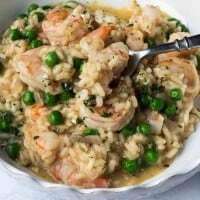 Creamy risotto with delicate, herbaceous dill, plump Gulf shrimp, and spring-fresh English peas, all tossed with creamy chèvre...Spring Risotto with Shrimp, Chèvre and English Peas tastes like spring, and makes a perfect main course for your beautiful Easter brunch or supper! 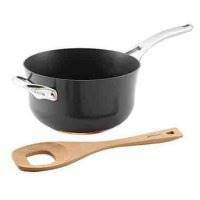 Put your broth in a medium saucepan on medium-high heat and maintain a low simmer. Using a good quality, fairly heavy pan (I like my enameled cast iron small dutch oven), heat the olive oil, add the shallot and minced garlic. Sauté until translucent. Add the rice, and saute until the rice is fragrant but not browned (about 2-3 minutes). De-glaze the pot with wine or sherry. Add salt and pepper. When most of the wine is absorbed, begin to add the hot broth a ladle full at a time as it continues to absorb. Stir frequently. This process will take about 30 minutes +/-. At about 25 minutes, add the prepared shrimp and the peas (whether fresh or frozen). Cook until the shrimp are pink and opaque. The risotto is done when a rice grain is al dente (still a bit firm and chewy but tender). The starch will have been released into the dish creating a creamy consistency. Add the fresh dill and chevre. Stir in gently. Check for seasoning. To serve, garnish with additional chopped fresh dill and chives. Enjoy! Macronutrients are from MyFitnessPal.com and an approximation only! Wow Tamara! This looks absolute incredible & is chock full of a bunch of my favorite ingredients. As for dill. . .I am a big fan of this herb and quite jealous that you have a garden full of it. I absolutely have to try this ASAP! 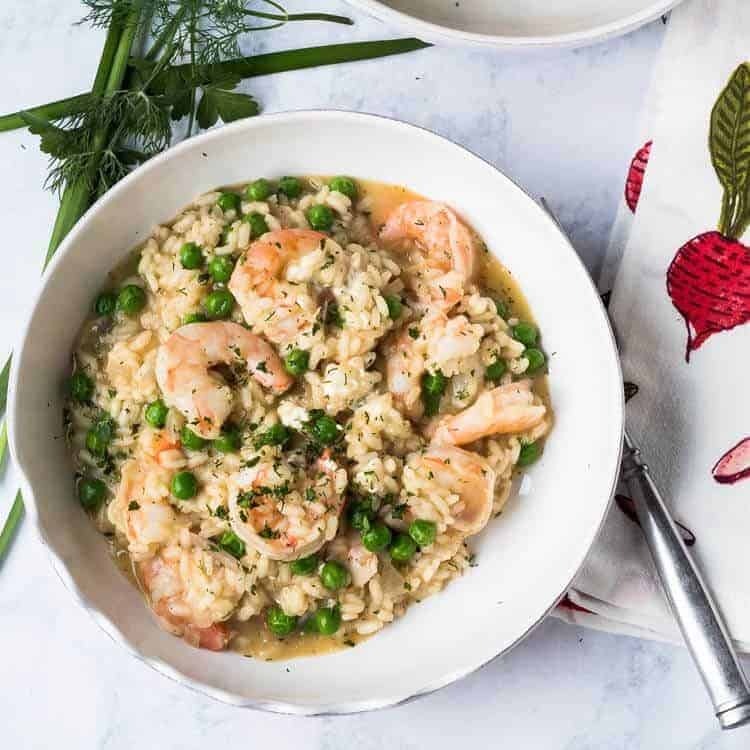 I love risotto and usually go for asparagus or butternut squash, but this looks too divine not to try! Plus, it actually has protein unlike what I make haha! Wish we had Bob's Red Mill here, I hear their gluten free flour blends are awesome! I guess you tried it, and liked it Michelle! Yay! I'm always so happy to hear my recipes have been well-received! I love making risotto. But, I am a creature of habit, and don't veer to far away from plain old parmesan and butter. What a nice addition this would make for a brunch. I love how lovely the shrimp, peas, and chevre come together. Habits die hard, don't they? I have a few of my own... 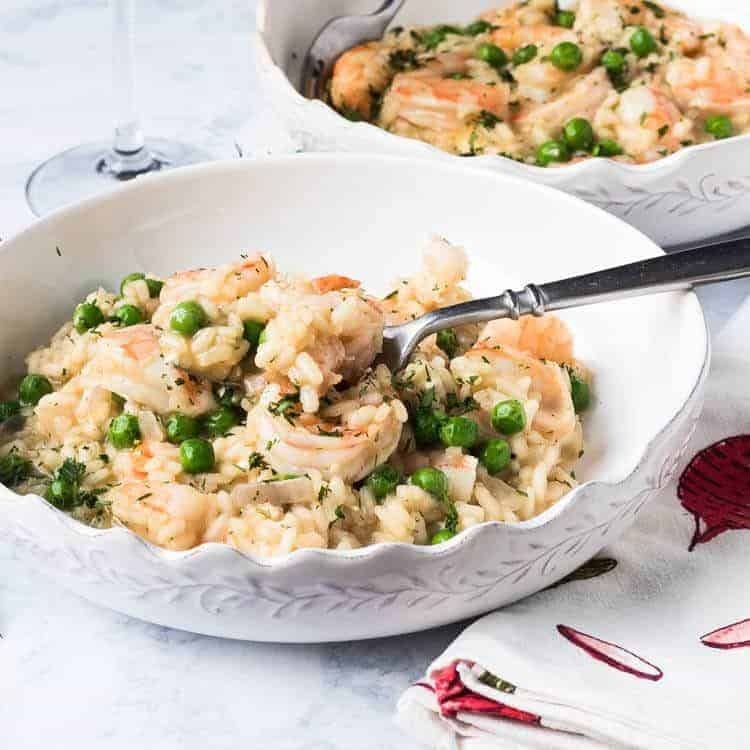 However, I do love to play with risotto, and this one with its spring flavors is lovely!